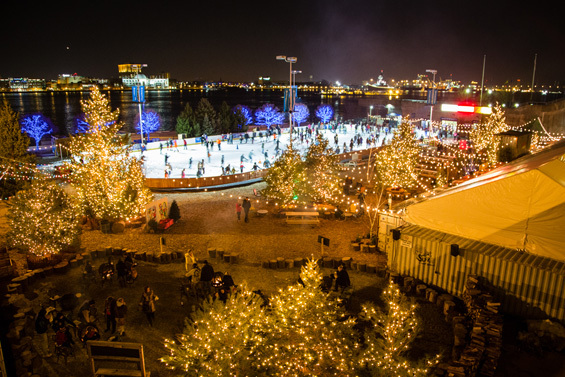 Penn’s Landing’s Blue Cross RiverRink celebrates 20 years of ice skating on the Delaware River by transforming the annual waterfront rink into a veritable winter wonderland. 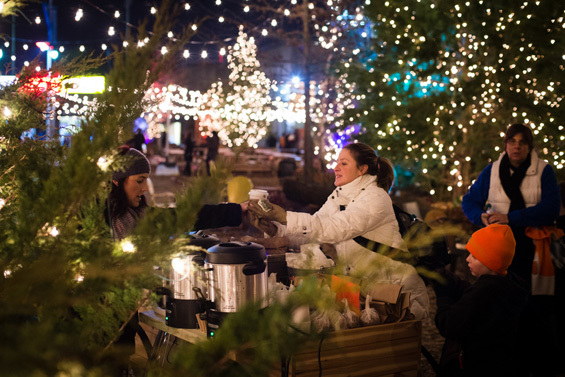 In conjunction with Delaware River Waterfront, the skating rink location was transformed by Groundswell into a daily wintertime festival with shipping containers repurposed into retail shops, and food and drink served in a fabricated forest setting with Pine, Spruce and Holly trees, fire pits, rustic seating and signage. 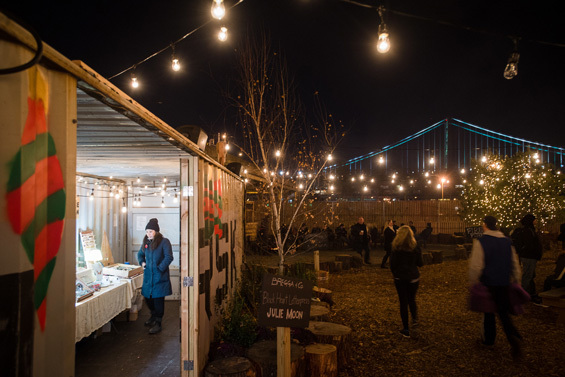 For 37 days throughout the holiday season, the waterfront hosted a pop-up holiday village. 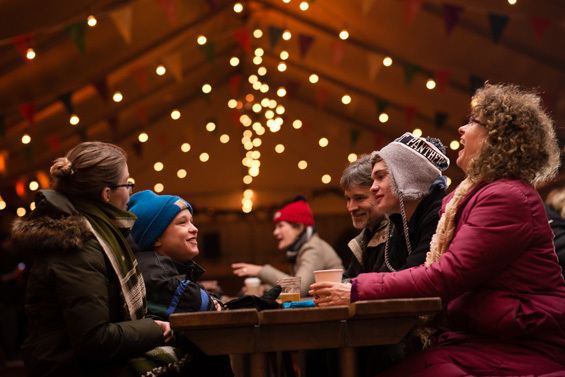 Philadelphia’s newest holiday tradition, Waterfront Winterfest at the Blue Cross RiverRink, reimagined how you celebrate the holidays. The grounds were designed by David Fierabend of Groundswell Design Group and will feature a 500 person warming tent created from recycled shipping containers surrounded by a garden oasis of pine trees, and of course, the Blue Cross RiverRink. The Lodge, a restaurant with acclaimed Philadelphia chef George Sabatino served a new take on winter favorites. The Art Star Holiday Market curated by Art Star Gallery & Boutique will be available on-site with special pop-up shops throughout the entire festival. Waterfront Winterfest will also feature an hourly holiday light show by acclaimed visual artist, filmmaker and pioneer of video projection mapping, Ricardo Rivera. 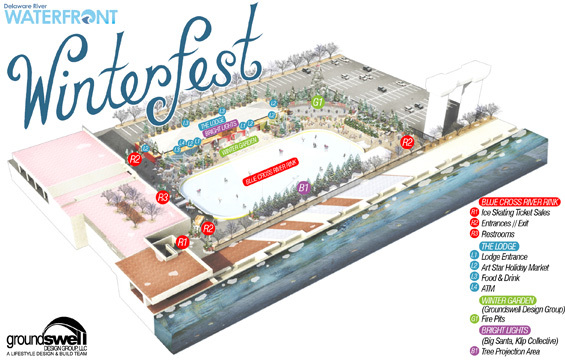 Waterfront Winterfest will also host daily ever-changing traditional and non-traditional entertainment. 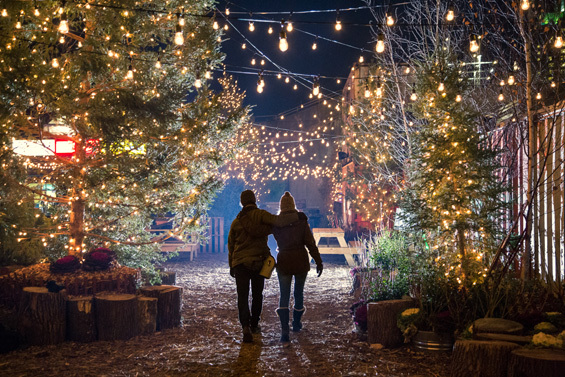 Groundswell Design Group created the setting for the magical winter wonderland that surrounds the Blue Cross RiverRink. Fierabend brought his expertise from recent projects like the PHS Pop Up Garden in Center City, Morgan’s Pier, and the Sol LeWitt exhibit at the Philadelphia Museum of Art to the waterfront in the form of a winter garden and forest. 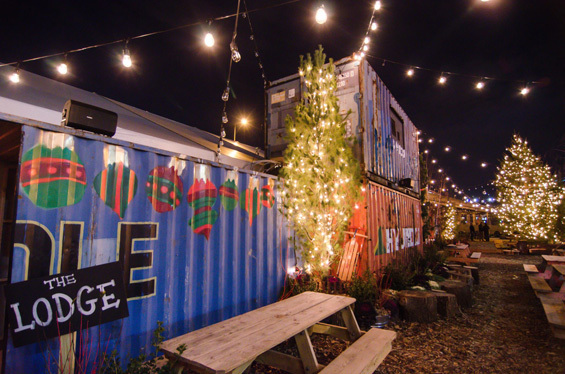 The entire Waterfront Winterfest experience used 14 locally sourced shipping containers covered with a huge 180′ x 40′ warming tent to create the American-style beer garden dubbed The Lodge, which is the largest public plaza ever created exclusively from recycled shipping containers. All of this overlooks Philadelphia’s Benjamin Franklin Bridge and Delaware River making for some breathtaking views. 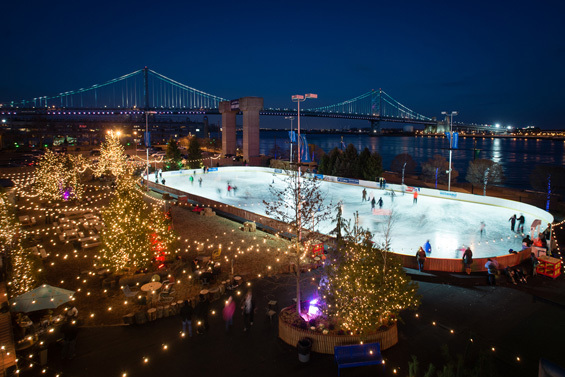 The Blue Cross RiverRink at Penn’s Landing transformed into an inviting winter forest with 70+ evergreen trees, including White Pine, Hemlock, Blue Spruce, and Norway Spruce, 3 centerpiece Blue Spruce for the lighting show, and more than 500 shrubs and ornamentals including Winterberry, Holly, Red and Yellow Twig Dogwood, and ornamental cabbages. 125 yards of woodchips create the feeling of a forest floor. 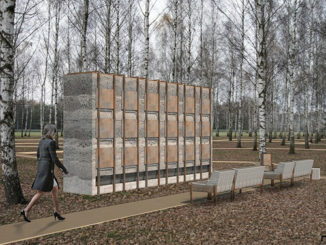 Scattered throughout the trees is a small seating areas with rustic furniture, providing intimate small-gathering locations. This is a perfect family friendly destination for the holiday season in the city. The sights and smells create an out of city experience, giving the impression that it’s located in the forests of The Delaware Valley.